Exclusive Sole Mandate. This contemporary masterpiece is the definition of form, function and enlightened thinking. Comprising four bedrooms and 3 and half beautiful bathrooms, the open-plan layout is as suited to formal entertaining as it is to family life, with a mix of flowing social areas and integrated private spaces. The captivating entrance merges into the dining area and kitchen which serves as the core of the house with its highest-quality finishes and impressive custom designed counter. 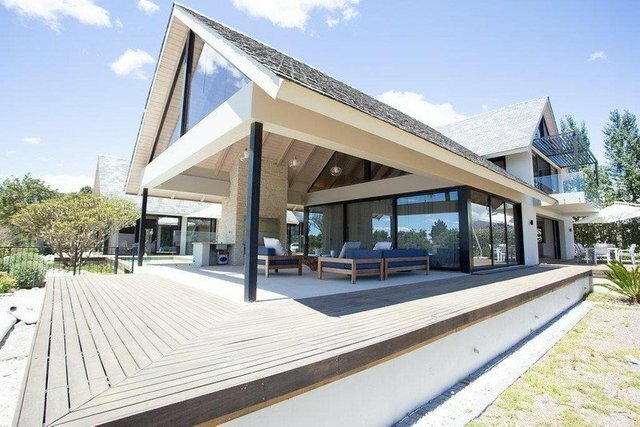 The double volume roof in the living area with sliding doors opening up the house completely gives light and break-taking views of the mountains, world class Jack Niklaus golf course and surroundings of this 'Top Residential Estate in South Africa' for three years running. The sleek silhouettes of the house compliments the focus on technology with a central vacuum system and a multi-room automated audio system. The house is completed with a luxurious master study with incredible views, 180m2 of deck around the house, a swimming pool, a patio completed with engineered flooring and finishes and a garage that easily fits three cars. The estate boasts a world renowned Jack Nicklaus designed golf course, a polo field, restaurants and hotel and a luxurious and relaxing lifestyle. With its oak flooring, visual aesthetic and open plan living, this property is of tremendous beauty, this is luxury living at its grandest.